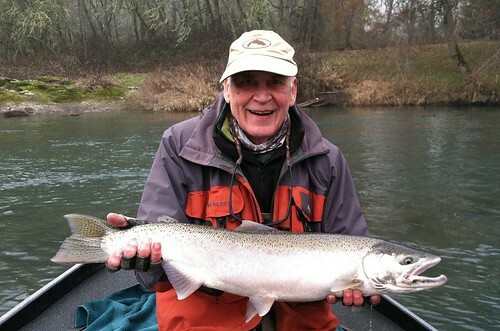 Eugene Area Summer Steelhead Report: 2014 Is Looking Good! 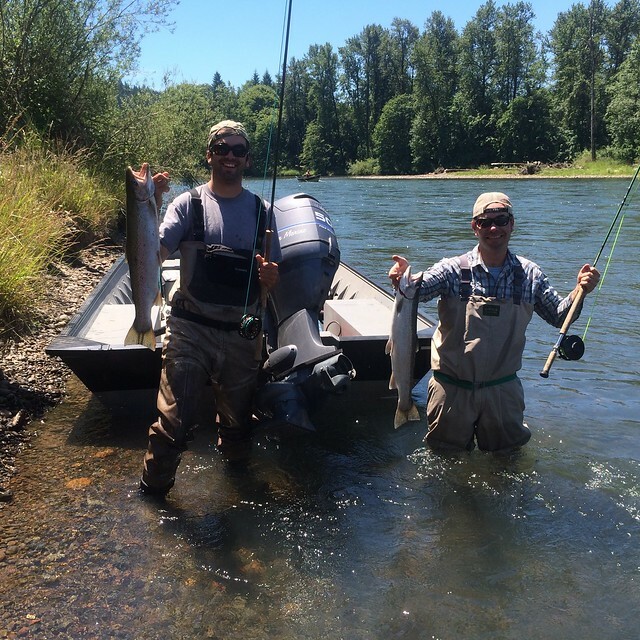 After a somewhat disappointing return of summer steelhead in 2013, this year is looking and fishing much better on the Willamette valley’s summer steelhead streams. 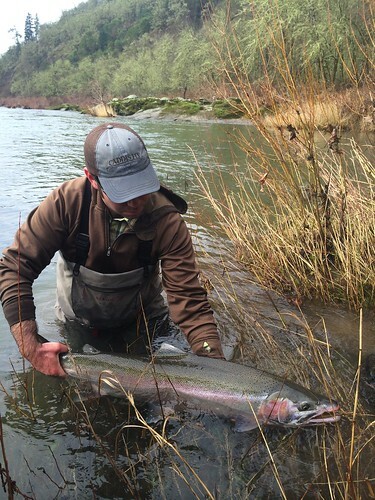 Fish numbers over Willamette Falls are already much better than last year, with more fish on their way. The fish have been responding well to swung flies. I have been fishing fairly small pink/purple and black/blue leeches with good success on various sink tips ranging from Type III to T-11 depending on the depth and flow of each spot. That being said, I am sure that floating lines and traditional patterns would work as well, particularly in the shallow and shaded spots. 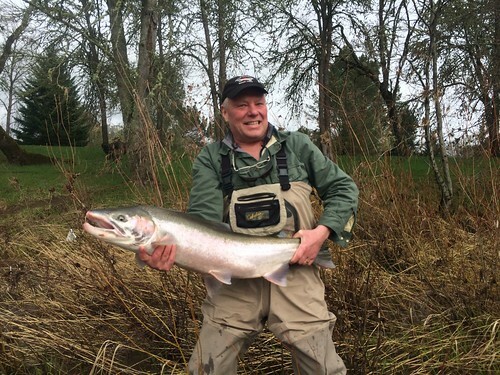 We are blessed with a long summer steelhead season in the Eugene area. 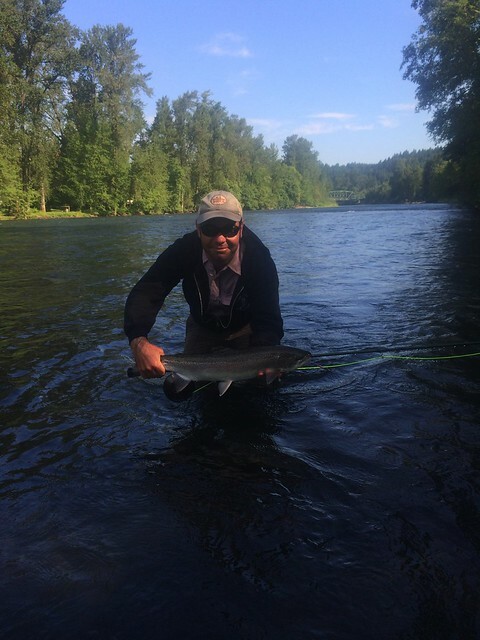 Our fish start to show up early, and will inhabit the riffles, runs, pools, and tailouts of the McKenzie and Willamette throughout the summer and fall. 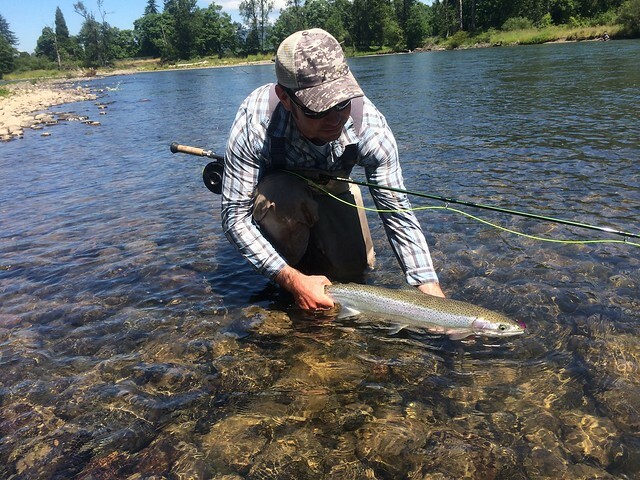 Better than anywhere else I swing flies for summer steelhead, the fish in our area streams respond well to the swung fly even in bright sunlight! Shaded conditions are always nice, but the sun is by no means a deal-breaker. 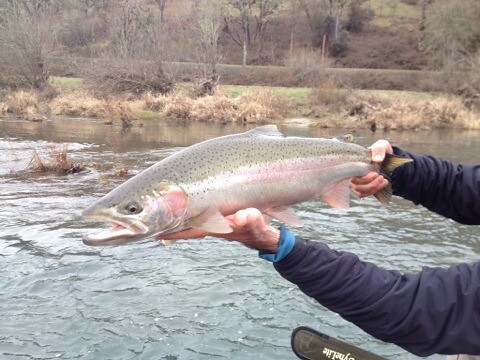 On the last couple of outings I have seen a number of steelhead taken while swinging flies in bright, sunny conditions. 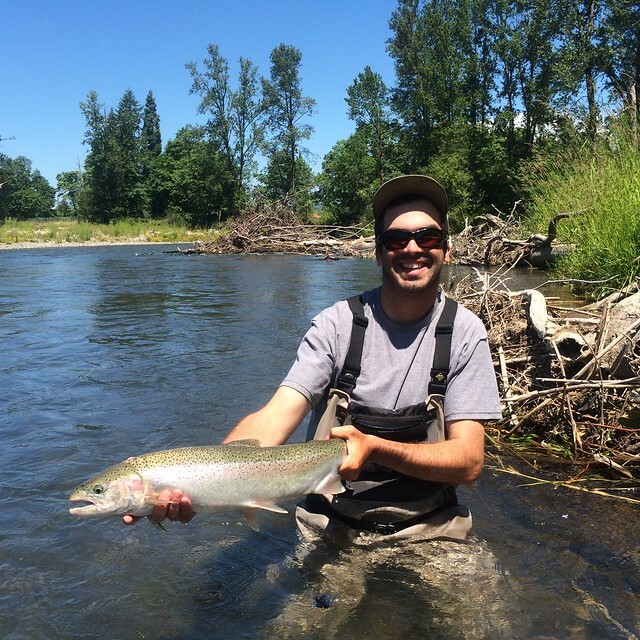 Please call or email to come experience some of the best summer steelhead flyfishing in Oregon! 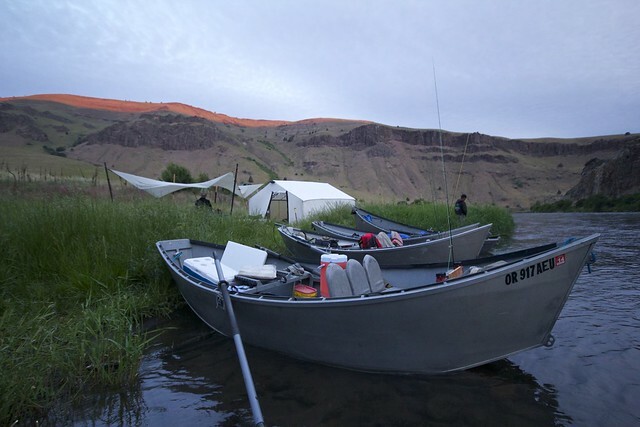 I just got home from another four day trip on the Deschutes. 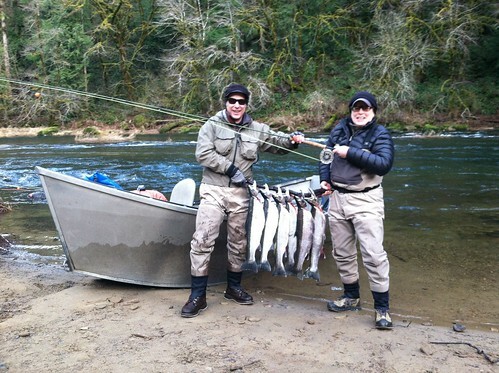 We had great weather, very good dry fly fishing, and an excellent group of guests; nice guys and good fishermen. 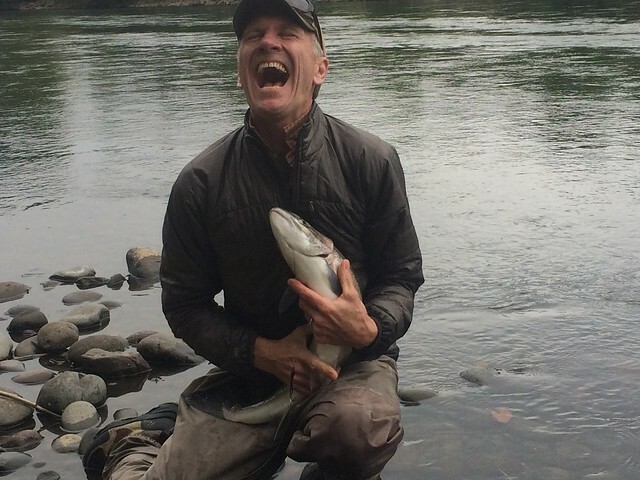 When luck and conditions line up like this, it is hard for everyone, guests and guides alike, not to have a great trip. 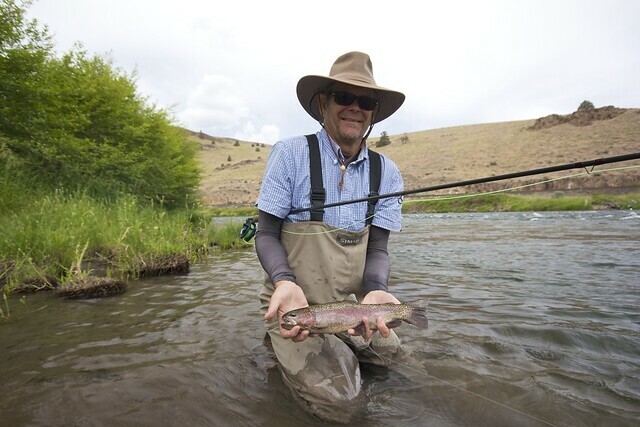 At this point the salmon flies and golden stones are well distributed from the Maupin area all the way up to Warm Springs. As the hatch progresses, the bugs will thin out on the lower end (around Maupin), but good numbers of bugs should stick around on the upper reaches for some time. 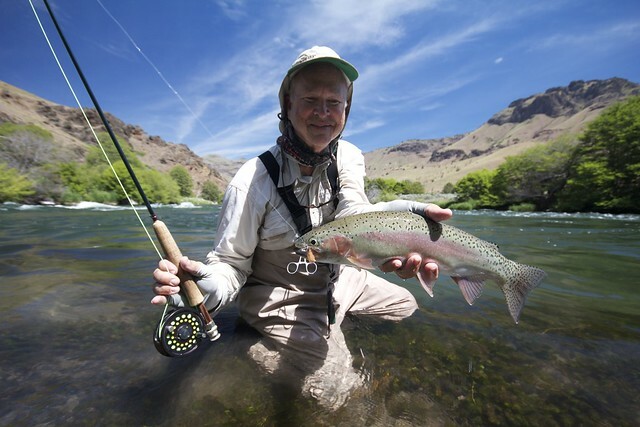 The Deschutes River salmonfly hatch is the best in the country, likely the most prolific in the world, but is often also accompanied by a fairly substantial drift boat hatch. 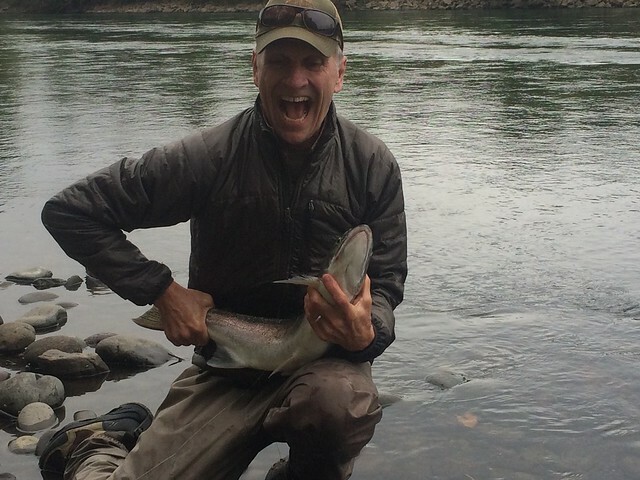 This last trip was no exception, there were substantial numbers of other guides and fishermen around, but we had very good dry fly fishing nonetheless. 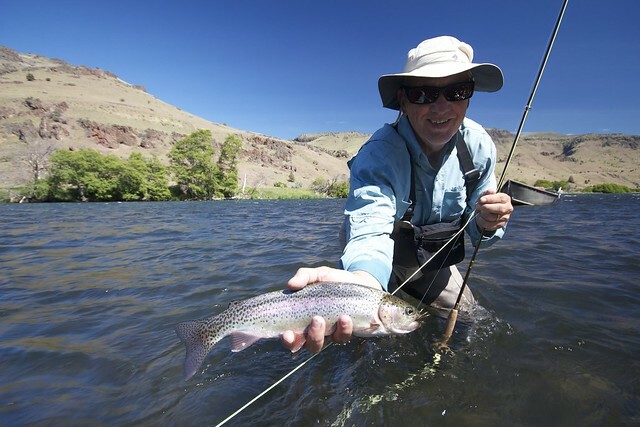 Fishing successfully around or behind other anglers and guides often requires some strategy. 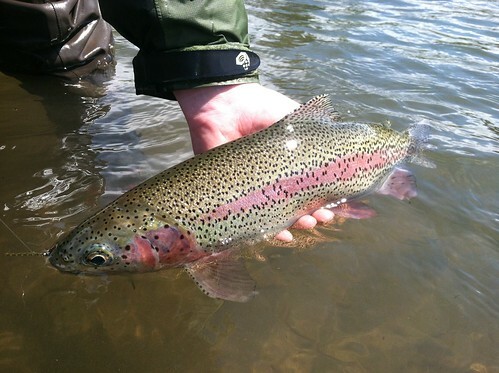 The low hanging fruit has often been plucked; the easy spots out in the open have often been fished hard, but in the out of the way areas around brush, trees and low-hanging branches, and in the areas that are more difficult to wade, the fish are often relatively undisturbed, and very willing to attack a big dry fly. 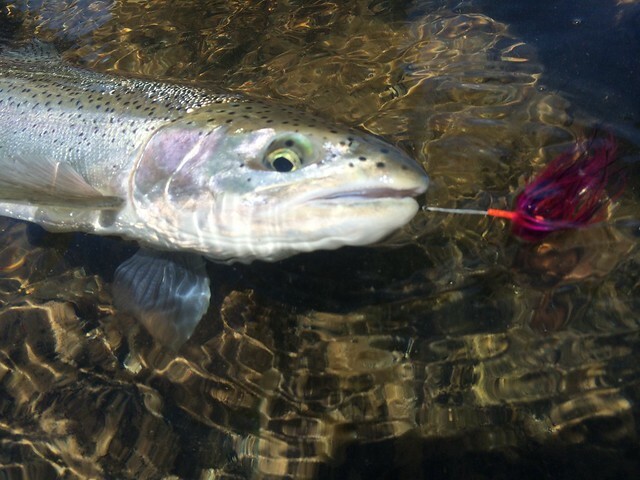 The way the fish eat the fly is my favorite part of fishing the salmonfly hatch. The takes are often startling, like a toilet bowl flush under the fly. Sometimes the strikes occur under the rod tip and are so violent that the fish splashes the angler. 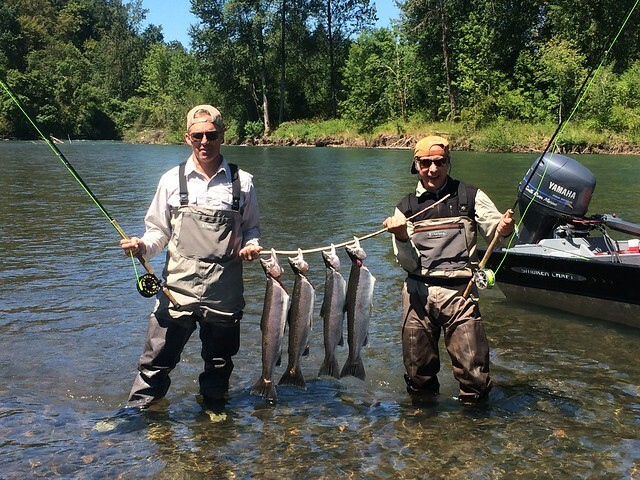 Special thanks to the guys who came fishing with us last week: Keith Steinbruck, Robert Jones, Keith Sherman, Tom Doherty, Mike Stickel, and Rick Fairbanks. 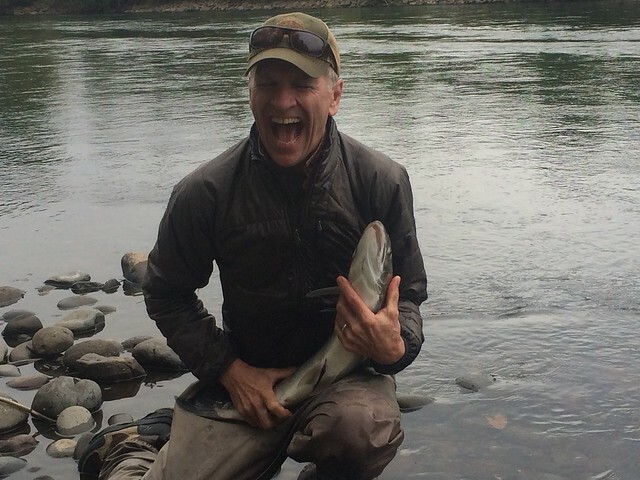 All photos in this post were taken by my good friend Matt Ramsey, who was guiding with us on the trip. Many thanks to Matt for sharing the images. He has a great eye for photography and takes much better pictures than I do. 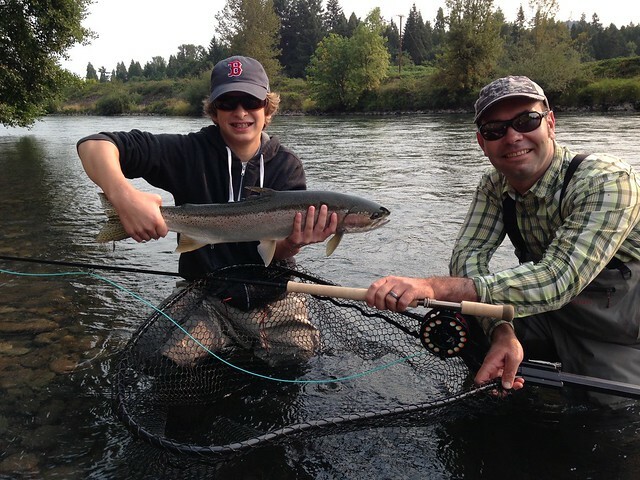 Now through the end of April, I am offering a discounted rate for half day trips ($275) on the lower McKenzie. 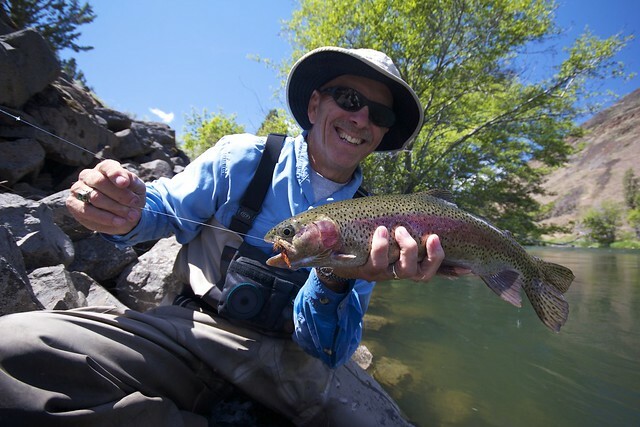 Late Winter and Spring offer some of the best fishing of the year for the lower McKenzie’s wild rainbow and cutthroat trout, with good nymphing opportunities throughout, and often great afternoon wet and dry fly fishing as the March Brown hatch materializes. 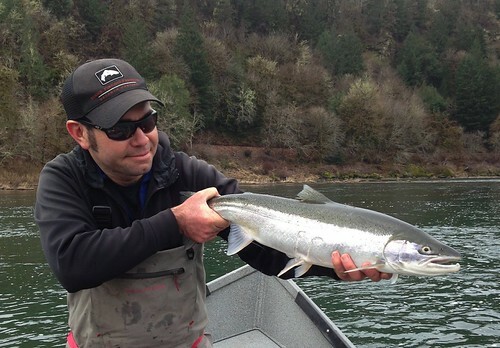 The best early season fishing is during the middle of the day as things warm up a bit, and a half day trip is the perfect way to take advantage of this window of opportunity. 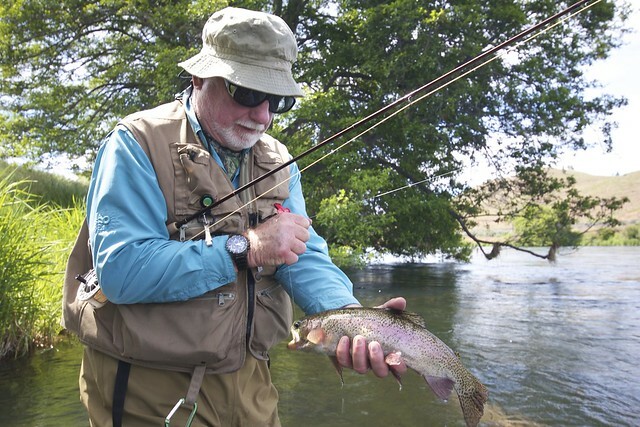 A typical day involves meeting at 9:30 or 10:00 in the morning, and fishing until around 4:00 in the afternoon. All tackle, flies, etc. are included, along with beverages. 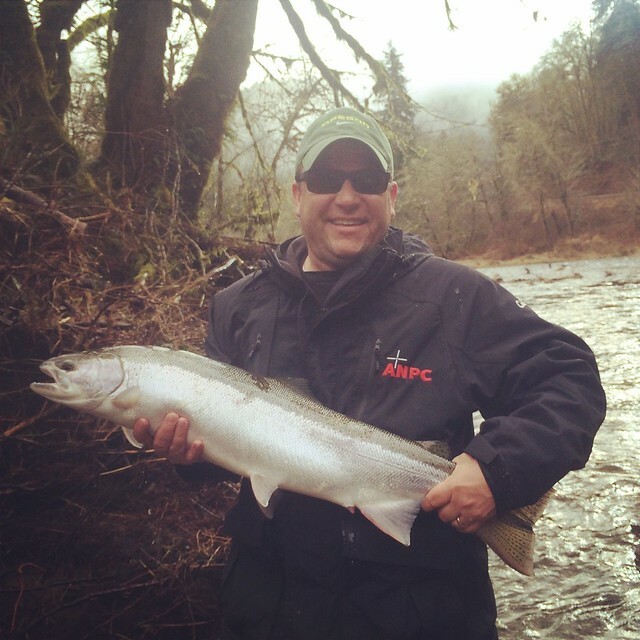 All you need to bring is some rain gear, sunglasses, lunch, and a fishing license! What could be easier? The lower McKenzie is currently in great shape. We are seeing good March Brown hatches most days, with some really nice fish moving to dry flies and wet flies on or near the surface when the bugs are out! 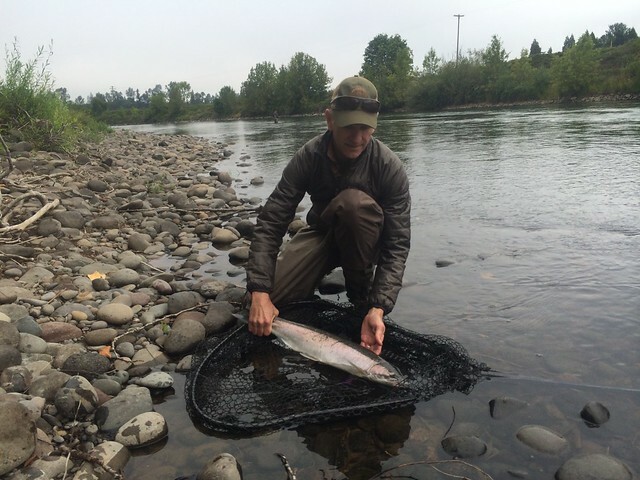 Judging from some of the fish I’ve seen in the last week, it may not be safe to wade in some of Oregon’s coastal rivers. These big bucks look mad, and they have teeth! I advise staying in the boat. 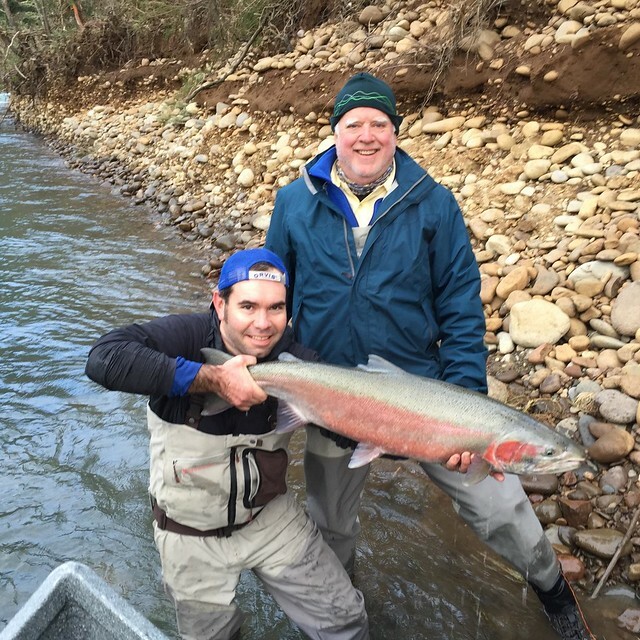 Seriously though, steelhead fishing has been good of late, with many coastal rivers falling into great condition in the wake of February’s flooding. 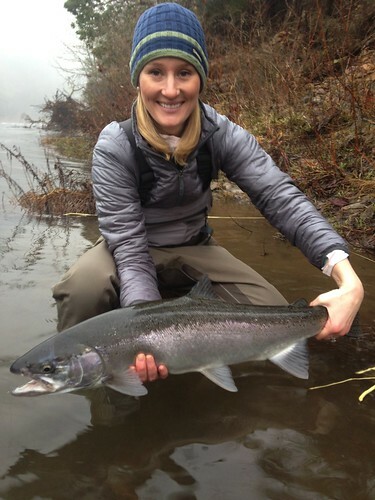 Though hatchery returns are thinning out, as is typical for this time of year, the wild run of winter steelhead is still going strong and will continue through the end of March. 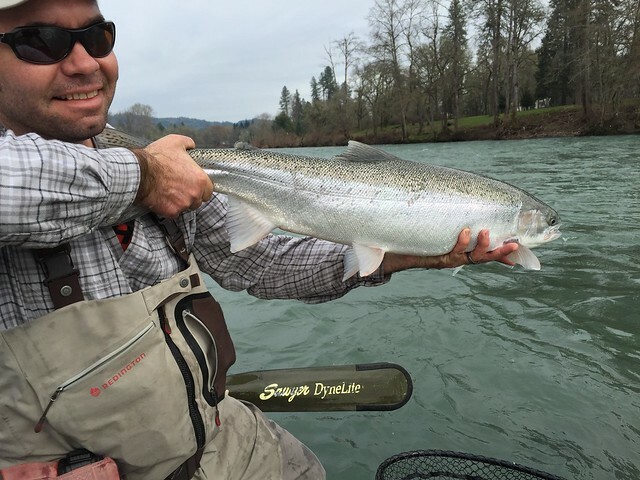 Much of February, usually a great month to fish winter steelhead, was lost to prolonged high water, and it appears we are poised for another blowout: the forecast is calling for a few inches of rain over the next several days. That being said, things should drop back into shape before too long. I am booked up through the 17th, but have a lot of availability throughout the last couple weeks of March. It’s not too late to get out and wrestle some chrome! Call or email to arrange a day on the water. 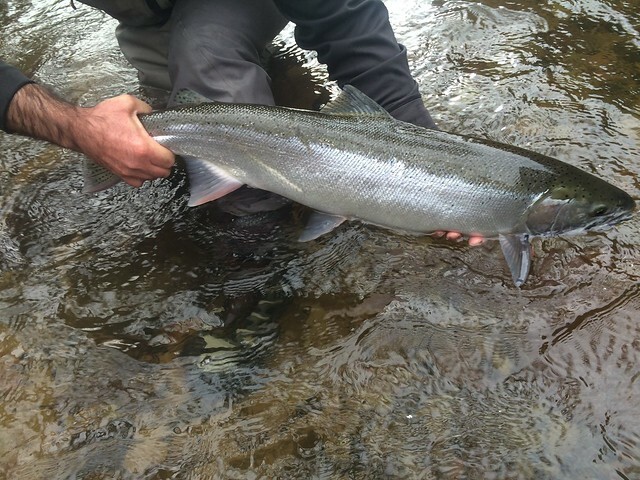 Over the last couple weeks we have had some rains to bring some fresh winter chrome into Oregon’s coastal river systems. 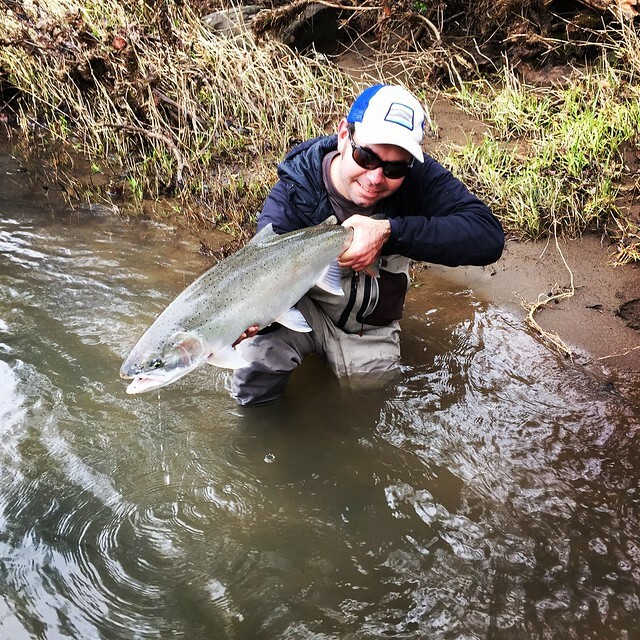 Depending on the drainage and timing, we have seen great catches recently of both wild winter steelhead and bright, harvestable hatchery fish. As of this writing, there is a lot of snow on the ground in western Oregon, and with warm rains on their way, it seems we are poised for a blowout. 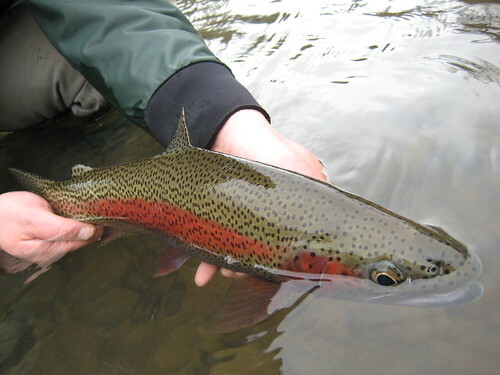 However, as the high brown water drops and fades to green, there should be another group of bright fish in the coastal creeks and rivers. 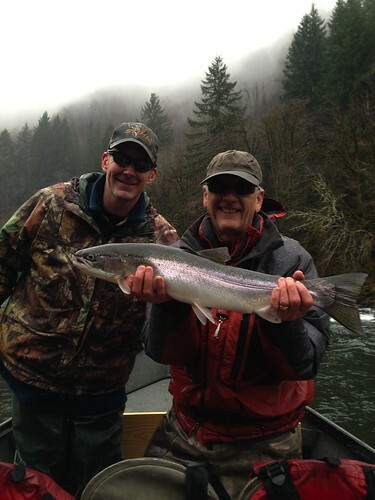 With about 7 weeks left to play in the 2014 winter steelhead season, we still have a lot to look forward to. 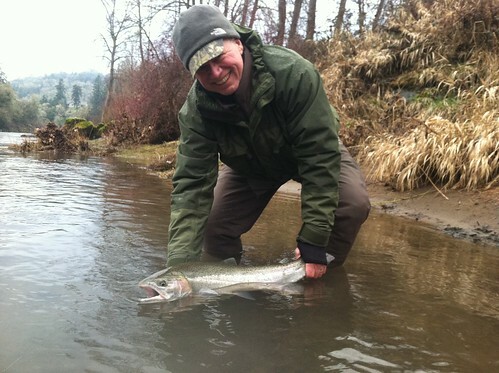 New fish will continue to pull into streams of all size up and down the coast. 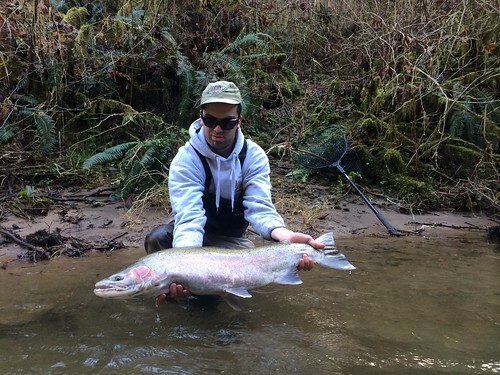 Winter steelhead season is my favorite fishing of the year. 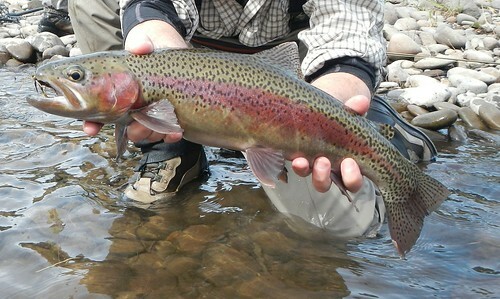 While the conditions are changeable and the weather sometimes inclement, these fish are amazing and beautiful creatures. 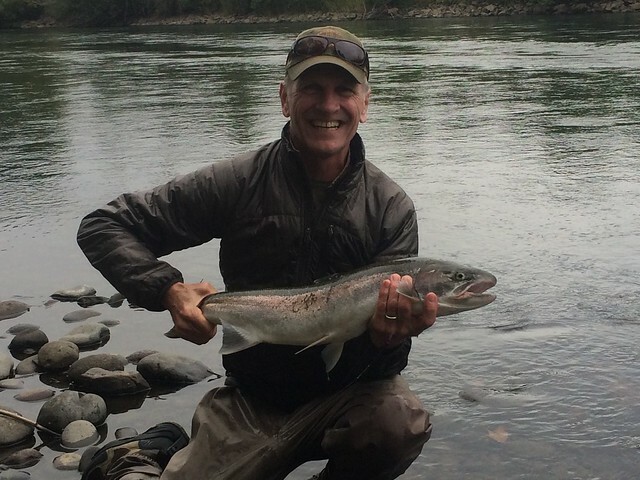 Though I have quite a few days booked over the next couple of weeks, I have a number of days still available this winter steelhead season, particularly in March. 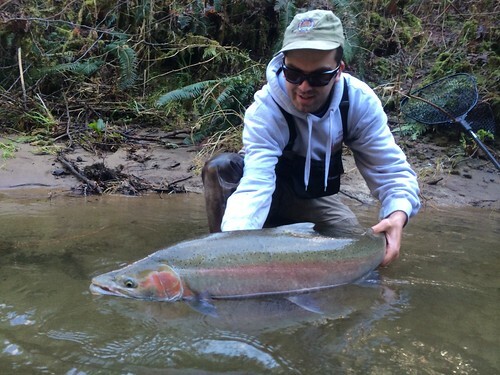 This is often the time of year when we see the biggest wild steelhead show up in our area streams! Please call or email if you would like to arrange a guided trip! 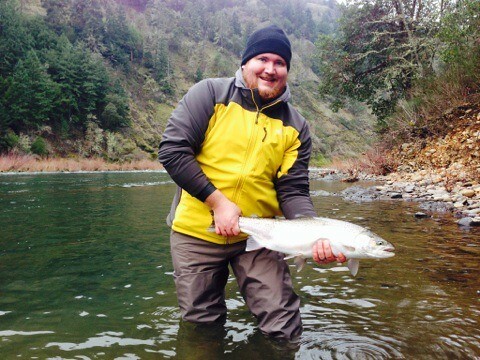 The rivers of Oregon’s central coast offer some truly world class winter steelhead fishing opportunities!